MosiGuard - Avoid being bitten. Mosquitoes can transmit several diseases including infections caused by Ross River, Barmah Forest, Murray Valley Encephalitis, Dengue Fever, Japanese Encephalitis and Yellow Fever viruses as well as Malaria, Filariasis (elephantiasis) and many more. In Australia, mosquitoes carrying Ross River and Barmah Forest viruses are found virtually everywhere. It is said that infections due to these viruses can be acquired virtually anywhere except within the Sydney and Melbourne metropolitan areas (even then, they can probably be acquired in pockets within, or on the edge of, these metropolitan areas). There are a number of steps you can take to stay safe and reduce your chance of being bitten. Most mosquitoes bite between dusk and dawn. After dusk you should try to avoid exposing your skin as much as possible. If your skin is exposed then it is important to use a safe and effective insect repellent on all areas of your exposed skin. 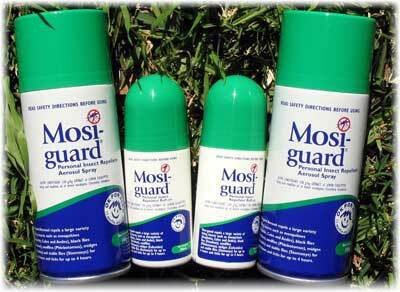 Mosi-guard has been shown to provide more than ten (10) hours of protection when applied directly to skin. When insect repellent is used on the skin it should be applied all over the skin that is exposed and not just dabbed on. To apply repellent to your face you can first apply it to your hands and then rub it over your cheeks avoiding contact with the eyes. If you are sleeping in a room with air-conditioning, this will discourage mosquitoes, otherwise you can use a knock down spray (any fly spray will do) to clear the room of mosquitoes. The plug-in insecticide vaporisers are very effective for overnight protection as long as the room is relatively free from draughts. These vaporisers consist of a heating pad onto which is placed an insecticide soaked tablet. The insecticide gradually vaporisers throughout the night killing any mosquitoes that get into the room. Mosquito nets provide very good protection especially when impregnated with the residual insecticide permethrin. There are a number of different styles of mosquito nets and you should choose the one most suitable for your journey. If you are staying for long periods in areas where you know mosquitoes are a problem then remember that they breed in stagnant water. You should therefore try to ensure that breeding areas within 500 yards of accommodation are regularly sprayed or eliminated. Aedes mosquitoes can transmit Ross River and Barmah Forest viruses, Dengue Fever and Yellow Fever, They are active mainly during the day and their peak biting times shortly after sunrise and shortly before sunset. To avoid being bitten by these day- time biters, it is best to avoid shady conditions outside in the late afternoon and if you are taking an afternoon siesta ensure you sleep under a mosquito net. Fortunately, you won’t catch malaria or yellow fever from mosquitoes in Australia but you can catch Ross River, Barmah Forest, Murray Valley Encephalitis, Dengue Fever, Japanese Encephalitis virus infections. What’s more, mosquito bites are painful and irritating and are best avoided. Some people react very badly to mosquito bites and the bites themselves can become infected and unsightly, especially in children. Mosquitoes are not the only problem. Anyone who has visited the coastal areas in the summer will know what a nightmare the plagues of biting midges (often incorrectly called “sandflies”) can be. Whether you’re walking, riding, fishing, cycling or just enjoying a relaxing day in the open air use Mosi-guard to stay bite free. Ross River and Barmah Forest virus infections are the most well known infections spread by mosquitoes, but Murray Valley Encephalitis and related viruses like Kunjin virus can cause serious and even fatal illness in northern Australia. In some parts of the world a mosquito bite can lead to more than just an itchy lump. Malaria, Dengue Fever, Yellow Fever and Japanese Encephalitis, even Filariasis (Elephantiasis) are some of the conditions spread by mosquitoes but there are many others. Some of these diseases can prove to be rapidly fatal and should all be avoided. More of us are travelling abroad each year and we are travelling to increasingly exotic destinations. It might be obvious that travelling to some countries will put you at risk from insect transmitted diseases, but did you know that a serious mosquito transmitted disease is becoming increasingly common in the USA ? West Nile virus has caused fatalities in some American towns and cities. Whenever you travel, always think of Mosi-guard and make sure your trip is enjoyable and safe.